SLAC has been meeting throughout the summer to discuss plans for development of Somerset Lake Nature Park. The money for the replacement of the dam is in place and the lake is scheduled to be drawn down after Labor Day 2017. The Park is envisioned to have restrooms, picnic pavilions, canoe and kayak rentals, and trails to explore the 200 acres around the lake. The first order of business is to establish a route for a trail circling the lake and brush it out to establish what will need to be done. This process was started by the Somerset County Conservancy in 2011 with a hiking trail on the west side of the lake built with some of the memorial funds for Retta Payne who loved birding and canoeing at the lake. A large group of volunteers this summer have pioneered a route and brushed out a trail from the south side of the present dam, completely around the south, east, and north sides to meet back up at the established trail. 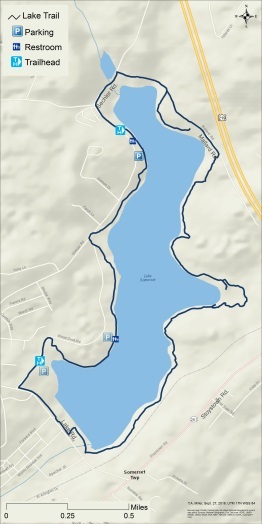 There is now a foot trail encircling the lake with the exception of the area immediately around the dam and the PA Fish Commission SW Headquarters building. This trail is nearly 5 miles long and, with a pair of boots, anyone can now walk around the lake! One of the most enjoyable aspects of the trail clearing was seeing the enthusiasm of the volunteers and hearing comments from young people like “Wow, someday I will be able to say that I helped build this.” The buy-in of the community and especially young people in outdoor activities and appreciation of nature is what the Conservancy is all about. There are several obstacles such as 3 small stream crossings and a large wetland area (when the lake is refilled) which will need engineering work and proper structures built. The Conservancy is willing to keep working on a cost effective trail and structures suitable for walkers, joggers and nature lovers to enjoy this beautiful spot right in Somerset Borough’s back door. Preliminary trail route layout was selected to follow a path of least infringement on wet areas and then easiest route that would require a minimum of disturbance of soil and trees. The Preliminary trail route was then GPS recorded and plotted prior to the group of volunteer’s coming to grub out a path. About one third of the East Trail is in good shape and the rest is roughed in, Permits are going to be required to construct boardwalks and bridges across wetlands and streams. Everything done to date has been accomplished by volunteers and donated materials.